I hope so. Keep reading, and you’ll understand the significance. Leadership is one of my favorite topics to speak about because I consider myself an expert in this area. You see, I have worked for and with great leaders who have inspired me, and I have worked for and with people in leadership positions who have left me feeling confused, angry, helpless, or worse…nothing. Both situations have taught me what it takes to be an effective leader. Becoming an effective leader is an ongoing journey, and if you head down the wrong path, it quickly becomes a lonely one. 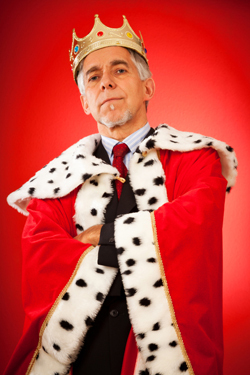 In my consulting practice, I try to help people avoid what I call “The Emperor’s New Clothes Syndrome.” Remember that fable written by Hans Christian Anderson? People with this syndrome believe they are wearing the finest clothes in the land (i.e. they believe they are admired and respected as effective leaders), and that anyone who can’t see their fine clothes must be “stupid and incompetent” (Hans’ words, not mine). But really they are parading down the street naked (i.e. they are not really as effective as they’d like to think they are), and everyone knows it, but no one says anything for fear of being called stupid and incompetent. Now, we’ve all probably had a little of this Syndrome at one time or another. But I hope that none of you have entered the danger zone where you can’t admit that others may be right about you, and instead work harder to keep up the illusion of effectiveness. Trust me, it’s much better to regularly engage in self-reflection and make a deliberate effort to become a better leader. This is what I mean when I say Lead With Your Clothes On. Make communication an art form. Explain the “what” and “why” in simple terms. It’s not necessary to impress people with jargon, clichés or highly technical terms. Know when it’s time to talk and time to listen. Enough said. Respond instead of react. Think before you speak. Keep the dialogue open by asking questions, reflecting back what you heard or clarifying your statement. Give direct and timely feedback – both compliments and constructive comments. Being direct is not the same as being disrespectful or confrontational. See and “sell” the vision. Dare to dream with both feet on the ground. Think big about the possibilities while being realistic. Involve others in creating a shared vision. This will generate buy-in and participation in making the vision a reality. Champion the vision again and again and again and again and again…Be a broken record (remember those things?) and verbalize the vision until others catch on. Let others share ownership of the vision. You are truly successful when the vision is realized and everyone feels they had a hand in making it happen. Surround yourself with people who think, work, feel, live and express themselves differently from you. It’s hard, I know. Push yourself to consider different perspectives, and your organization’s processes and services will be better because of it. Take steps to expand your own knowledge and skills. There are a lot of ways to do this. Reading this article is one of them. Find out what internal and external customers need in order to be satisfied. Your organization wouldn’t exist without its “customers.” A satisfied workforce is more likely to be successful in satisfying your clients, donors, funders and community partners. View problems as opportunities. Negativity spreads like wild fire. Effective leaders prevent or stop this negativity and always find the lessons to be learned. Establish and communicate a common goal. Focus on what you are all working toward versus staying stuck on the problem. Focus on how to make the change happen successfully. Focus on what needs to be done versus staying stuck on why the problem exists. Emphasize the possibilities that can arise from the change. Focus on the benefits that will result from the change versus staying stuck on any limitations of the proposed solution. Hear resistance as feedback. Instead of viewing feedback as a sign of failure, learn what is causing the resistance so that you can address it. Model the attitudes and behaviors you expect from others. It will earn you credibility, trust and respect. Hold everyone accountable – especially yourself. Set clear standards and expectations, then hold people to them. Follow through on promises you have made (and own up when you’re human and forget to follow through). Take responsibility for your actions and errors. Both the positive and the negative. In public and in private. Notice and celebrate successes, no matter how small. Recognize that sometimes the grand successes are achieved by adding up several small successes. Why This Matters for Your Mission: Effective leaders are critical to building high performance organizations that can fulfill their missions. Even if you are not in a traditional leadership position in your organization, you can still work on developing your leadership skills. Master these skills now and they will serve you well in any setting. Tip of the Month: Take a look in the mirror and make sure you are “leading with your clothes on.” Assess your strengths as a leader and how you can improve. Tell Us: What qualities do you admire in a leader? What tips do you have for being an effective leader? Find out how Optimal Solutions Consulting helps organizations like yours. Click on the Learn More button to read the latest blog post on managing change. Join today and receive your FREE copy of "The Five Qualities of a High Performance Organization"
Nicole Young, owner and principal consultant, has spent the last 20+ years working in the nonprofit and public sector (and still lives to tell the tale). Nicole offers practical tools and solutions to improve organizational performance and achieve better results. Please contact us to discuss your organization's needs. Phone: 831.594.1498 Fax: 831.685.2485 © 2011 Optimal Solutions Consulting, all rights reserved.